I MADE IT! I MADE IT! Sorry... didn't mean to scream but I've been trying to get a project into Crafty Secrets Monthly Linky Parties since I found out about them early summer and I just had not been able to work with the theme or work it into my ever so busy schedule. :p lol It interrupted my naps! lol I did manage to get a Christmas image prepared for one of their past challenges but just as I was getting it ready, I discovered I'd missed the deadline. I was ready this time! I visited their FB page and found out it would be a Halloween theme. I then stalked them on Pinterest and found one of their fantastic images to use... and now... tada! 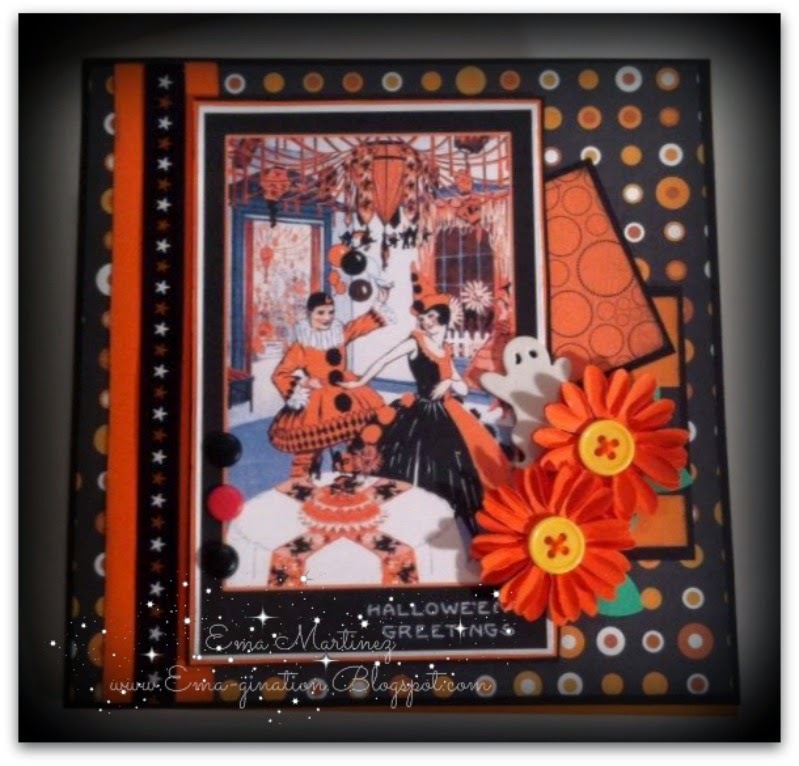 Beautifully done Halloween card...I just love the image and all your layers!! Thank you for joining us at "Crafty Secrets" for our "September Linky Party"!! Hooray, hooray! So happy that you linked up at both Crafty Secrets and Craft Hoarders! 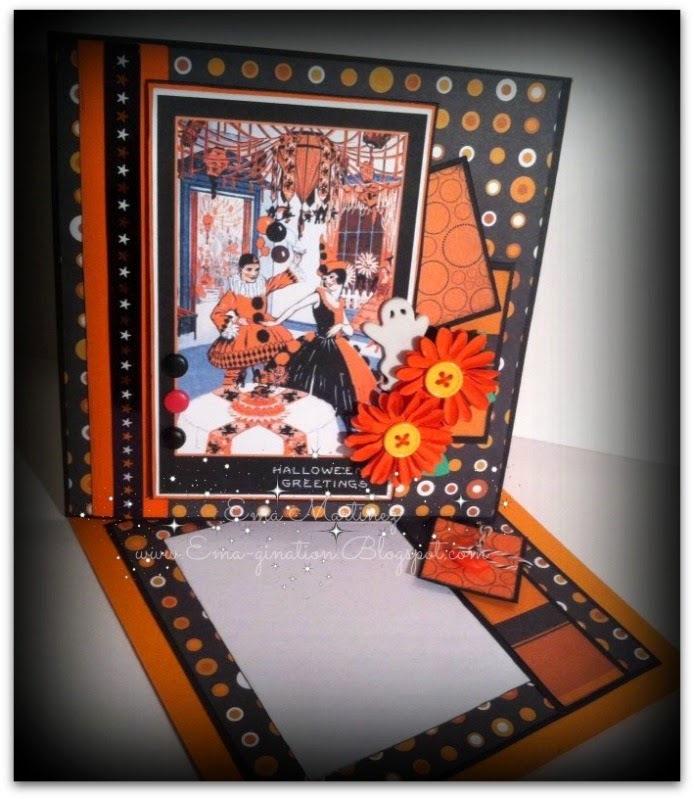 This is a lovely, lovely card, and I so appreciate how beautifully you used the image and your wonderful embellishments! Now that you've broken the ice, you'll have to play along every month! Thanks for joining the fun at the September Crafty Secrets Linky party AND at Craft Hoarders Anonymous Challenge 15: All the Pretty Flowers! 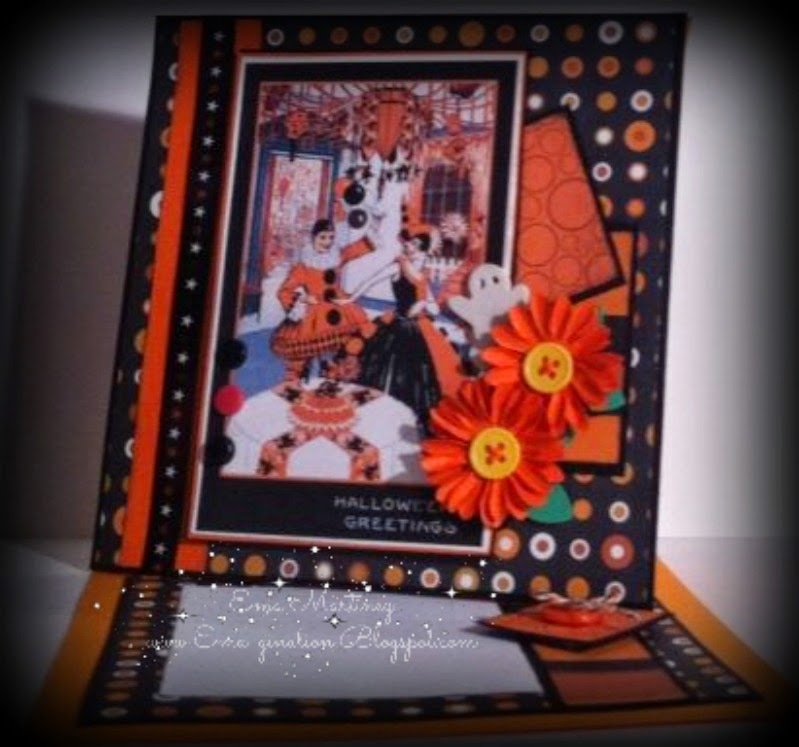 What a wonderful Halloween card! I love all the layers and those flowers with the button centers! Thanks for joining us at Craft Hoarders Anonymous! OMG this is AWESOME and I'm so glad you got it done on time! 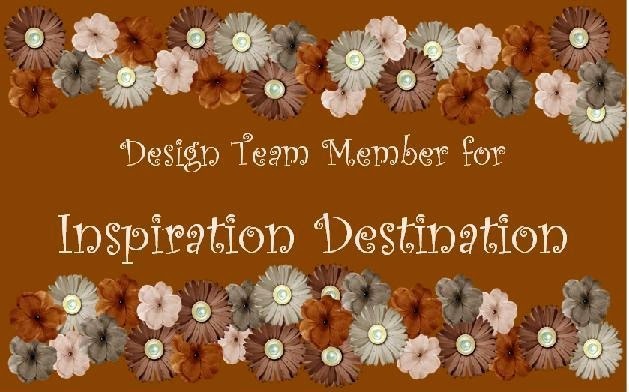 BUT DO REMEMBER, the theme is strictly for the design team! You can create ANYTHING for our challenge as long as you use a Crafty Secrets/Heartwarming Vintage product!! So feel free to 'work ahead' and then join us at the 1st of each month!!! Thanks so much for playing along in our September Linky Party at Crafty Secrets! Good Luck and hope to see you again in October!! We are so glad to see you at our Crafty Secrets Linky Party. It sounds like you were with us in spirit a couple of times before this. This is a gorgeous creation. There is a column on the right side of Heartwarmong blog with a whole bunch of free printables and remember the only requirement to enter our Linky Parties is just to use Crafty Secret produts somewhere on your project. ONly the design has a theme schedule. Anyway back to your card. All the years I have been stamping I have never made an easel card. I am so inspired by yours that I will make one for the next challenge. Thanks for the inspiration. So pretty, love it! Thanks for joining us at Craft Hoarders Anonymous! 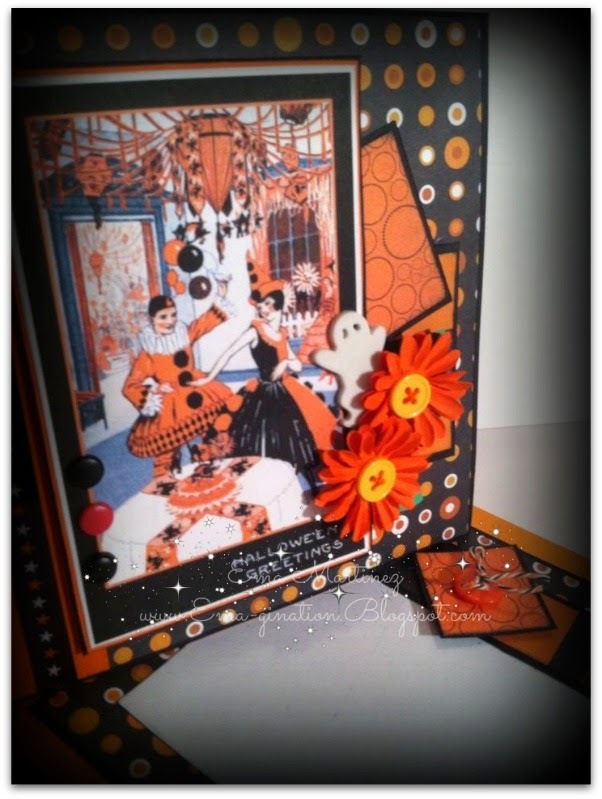 Thanks for joining the September Linky Party with this fabulous card! All the papers and embellishments you chose really complement the image perfectly - it's all so fun! Can't wait to see your entries in later linky parties at Crafty Secrets! Nice card, love the colors. Thanks for sharing with us at Craft Hoarders Anonymous Challenge. So fun. Love the orange! Thanks for playing along with us at Craft Hoarders! 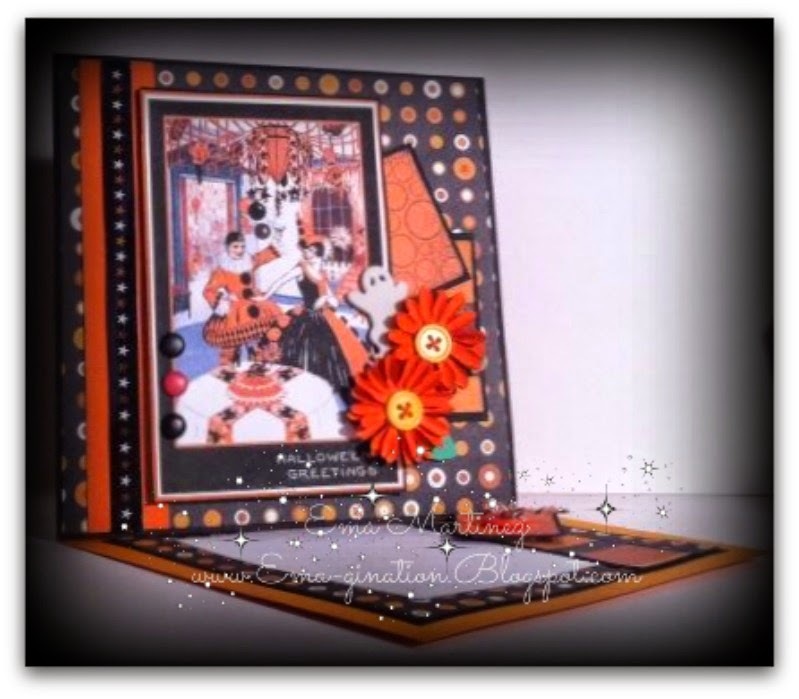 Hi Ema, your Halloween card looks fantastic and I love how you created it easel style. The best part is you were #4 the lucky random.org $50.00 gift card winner of this Sept Challenge. I just sent you an email and look forward to see what you pick out.